Yashi, an NRI from Zimbabwe tied the knot with native Mumbaikar Nipun in beautiful Aamby Valley, Pune. Our series, Featured Weddings brings you wonderful moments from weddings held at the finest venues across different cities. Here, Yashi tells us a love story that stretches from Zimbabwe to Mumbai with a Happily Ever After that begins in Aamby Valley. My family moved to Zimbabwe when I was 5 and we’ve lived there ever since. I’d always loved fairytales and dreamed of a Prince Charming coming to sweep me off my feet! Nipun, born and raised in Mumbai, loves sport, especially football and is an enthusiastic foodie. My first impression of him was his wonderful smile that radiated and his demeanour – he stood out. We’re worlds apart in some ways – I love people, laughter, books. Nipun is quiet, can’t sit still, a fitness addict. Somehow, we found each other and our love blossomed despite distance and our mismatched characters. Our marriage is arranged (still trying to figure how since we are happily in love). We met first in September 2015 and in February 2016 our families spoke again. We decided to meet in March and planned our roka for the 30th of April, my sister's birthday. There’s a funny story from our first month of courtship. We were going to the Taj Mahal for dinner. Nipun had an engagement ring and like any excited bride to be, I expected him to go down on his knees. We’d just finished shopping and as we got into the car to head to the Taj, he hands the ring over with an unceremonious “Try it!” My mind was racing, we were heading to one of the most romantic places in Mumbai and the man I’m supposed to marry is just asking me to try a ring on for size? Way to go romance! But little did I know… The next time I flew in from Harare, he waited three hours at the airport until I managed to exit at 4 am. I saw a large group of people waiting and he emerged from the crowd with flowers and that smile! I was tired and put the flowers aside and said, ‘Let’s go to the car’ and then he got down on one knee in front of absolutely everyone and proposed to me as an ‘audience’ of hundreds cheered! We got engaged 3 weeks later in June, with an elaborate engagement ceremony at the JW Marriott Sahar, Mumbai. Right in the middle of an ordinary life, love gave us a fairytale. As you can imagine, there was a lot of jet setting and Facetime when it came to planning. We were time strapped and had to whittle our venue options down to the Seychelles, Umaid Bhavan in Jodhpur or Aamby Valley. We visited each place and finally chose Aamby Valley. I remember being mesmerized when I visited with Nipun. The size of the place, the warmth of the staff, every step of the way was enchanting. 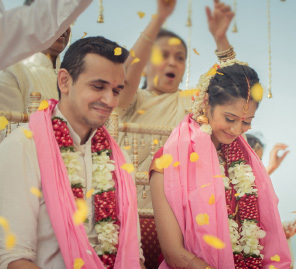 There were diverse locations we were drawn to - an island in the midst of a lake surrounded by mountains, a beach setting for the guests to kick back and relax, a beautiful Banaras Ghat setting for the ultimate backdrop for the wedding nuptials. Nipun and I wanted each of the wedding functions to be unique and different from each other and with Aamby, we knew we had struck the perfect venue for our destination wedding. We had an elaborate 3-day wedding that resonated with both the traditional as well as the modern aspects of us. We kickstarted the wedding festivities with a Great Gatsby themed cocktail party. Being fans of the decadence and glamour of the 1920s, we wanted to relive those days, through this cocktail ball. Each of our guests received personalized invitations, as well as hangover kit bags ( to help recover the next morning!). Nipun and I were meticulous with the décor details of the event. We ensured each detail of the Gatsby era was covered via signboards, flapper dancers and mixologists serving the finest from across various parts of the world. Our mehndi function was a traditional Rajasthani Mela at the Auditorium. We are both originally from Rajasthan, so we had Rajasthani ghoomar and kacchi ghodi dancers welcoming our guests. There were live laakh choodi makers creating giveaways, craftsmen making pots and jhootis and a Rajasthani puppet show, kathputlis. We wanted to incorporate as much colour into this event and we asked our guests to dress in green. Divans were set up in small tents around the main tent, ensuring a village like feel. The cuisine for this event, was Rajasthani, with gatte, ker sangri and of course, daal baati churma. The sangeet was held in Naga Village, an island in the center of the lake within Aamby Valley. We envisioned a Grand Masquerade to celebrate the sangeet. We had a 60-foot stage with masks as the main motif - matching masks were used as centerpieces for the round tables. Upon arrival by boat, the guests would then enter through a maze like walkway lit with fairylights hanging down creating a magical entrance. Our families performed, which was wonderful and Nipun’s friends did a skit highlighting his college life as well as his experiences with his various wedding proposals. We ended the night on a high, with a performance by Rahul Vaidya, who created quite a stir with his voice. Nipun and I performed to a mashup of three songs close to our hearts as well as our relationship; Thinking Out Loud (Ed Sheeran), Love Me Like You Do (Ellie Goulding) and Sau Aasman ( Baar Baar Dekho). The pool party was to kick back and relax. a laidback event, in which guests could swim, splash around in the wave pool or sway to the tunes played by DJ Alex and our liquid drummer. We had a candyfloss station, a gola cart, with unique flavors like malai gola, and the crowd favorite, kala khatta! We ensured an array of cuisines for the event with our personal favorites; Mexican, Italian, South Indian as well as Nipun’s favorite, missal pav. My five bridesmaids wore matching maxi dresses, each a different color accentuating their personalities! The décor was simple, with touches of the sea in the event, large anchors, quotes and ships! After all, I did come across the ocean for Nipun! Our wedding was the grandest and most awaited function. The royal baraat consisted of two camels, ten spear men, ten chattarmen , eight horsemen , an eleven piece brass band, a twenty-one piece puneri dhol, two tutari, ten soldiers with Nipun bringing up the rear on a beautiful decorated horse. The baraat paved the way for the ultimate location for the nuptials, the grand Banaras Ghat. Our pheras were at night and from a distance one could see the setup glistening with the entire staircase from which the groom descended covered in flowers. The floating mandap was an elaborate temple setup with the Aamby Lake as backdrop. As vedic chants resonated in the air, the ambience of the wedding entranced and mesmerized all, as they watched me come in to meet my Prince Charming by boat, followed by a beautiful phoolon ki chaadar, my brothers by my side. Our attire was in accordance with the royal theme. Nipun wore a Manish Malhotra sherwani and I wore a customized lehnga with the baraat story etched into it, something I’d always wanted. We ended the wedding festivities on a high note, with a reception themed ‘Wonderland’. At the entrance, winter wonderland motifs were suspended for guests to walk under. Solitaire, an international band, played a beautiful symphony, instrumental versions of all our favorite songs. On stage, the décor featured a Tree of Life with flowers cascading down and lanterns. We also showed our guests a same-day edit of our wedding film that covered the three days of festivities. They were thrilled! Credit to Megha Israni of Signature Films for making sure the film was completed in such a short time and ensuring our reception ended on a high note. Our planner, ENJAY Events were amazing and ensured a seamless wedding while our decorators brought our visions to life. Stay cool! Always! 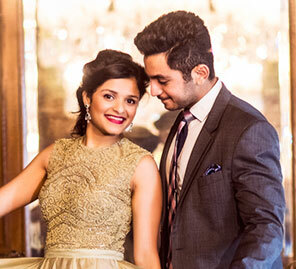 Nipun and I kept calm through the process of selecting vendors, wedding details and trousseau shopping. Get to know your vendors on a personal basis, that way they will understand your vision better. Write those emails, make those phone calls - the extra effort and consistent follow through with details is what takes the wedding from good to great! Keep your vision clear, do not get sidelined by various options, know what you want and how you want it, stick by it and execute it. The most important thing is to have a solid, reliable team who can handle the whims and fancies of a wedding! And just like that your wedding will be fantabulous! Wishing everyone reading this, all the very best for their upcoming adventure!